As the temperature rises, pet owners become increasingly concerned about the health and comfort of their pets. In fact, this time of year, I spend 1.5 months worrying about my long-haired Persian cat in my AC-less apartment as I watch the thermometer rise to 85 degrees Fahrenheit - inside. Fortunately, the heat offers a great opportunity for pet specialty retailers to defeat the summer slowdown by offering pet products designed to help customers' pets stay cool, calm, and comfortable. Combine that with highly engaging and educated employees and your store is sure to become the go-to destination for pets even outside of the holiday season. It's a well known fact that mammals require water to stay hydrated and healthy. In fact, proper hydration is required in order for mammals to digest food properly. Without the right amount of liquid, the body has a lot of trouble making up for the lack of it. In other words, the more moisture in pet food, the less that's needed from sources in the pet’s body to digest the food. There has been an emphasis on pet hydration over the years, and this is especially true during the hot summer months. As such, it's crucial to promote hydration through your in-store displays, merchandising, employee engagement, and product selection. Wet pet food - This includes products such as cans, pouches, pots, etc. Along with moisturizing dried foods, pet owners use mix-ins to pamper, customize and reward for good behavior, with a degree of “speed-scratch cooking” serving to strengthen the bond between pet parent and pet. Merchandising Tip: As you refresh your store's merchandising for the summer, consider placing any of these products on a separate display toward the front of the store. On or near that display, offer informational brochures, flyers, or even a poster to educate your customers on the importance of hydration as well as signs of dehydration and ways to prevent it. Imagine sitting inside on a hot summer's day with no air conditioning or way to stay cool outside of simply drinking water and staying absolutely still. Now imagine how great it would feel to sit still on a pad that stays cool and keeps you from sweating out all the water inside of you. Summer pet beds are designed with special fabrics and functionalities to help keep pets cool as they sleep off the heat. There's nothing like trying to sleep while the thick couch fabric soaks up your body heat and seemingly reflects it back on you. There are a few different types of designs ranging from elevated pet beds (like this cot bed) to pressure-activated self-cooling gel pet pads (like this one). But what about for those who are on the go? Cooling harnesses and protective booties for dogs are perfect for going for a walk on a hot day. Not only do they keep your pet protected on the hot sidewalk, but they also keep them nice and cool along the journey. Merchandising Tip: Style your customer's dogs for them! Like a fashion retailer, consider pairing vests and booties on a display together to create a stylish and protective outfit. Don't forget the cooling pad as an add-on for after the walk! There are two types of people: those who spend the summer hiding in air conditioned spaces and those who utilize every spare moment for fun in the sun. Depending on where you're located (i.e. Phoenix versus Seattle), you'll know who your customers are. 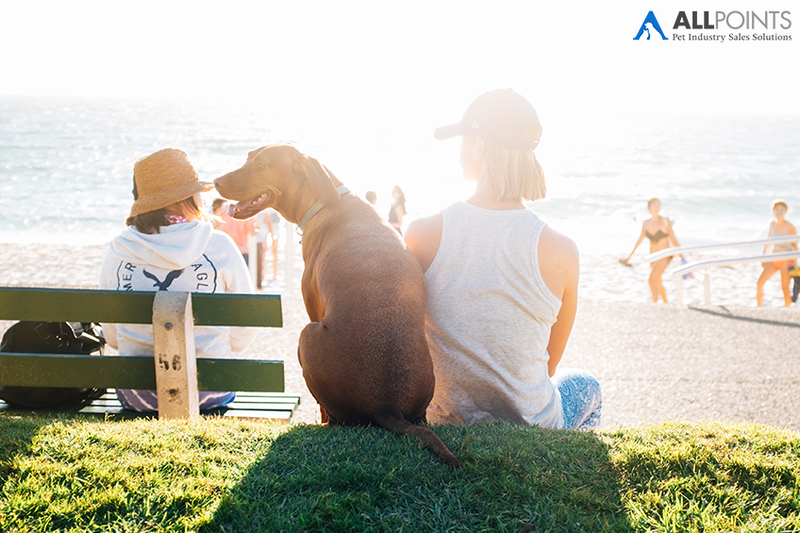 One of the many benefits of summer is the ability to get outside and go on adventures with your pet. While outdoor activities are great ways to bond with pets, many of them require gear to keep pets safe, comfortable, and happy along the journey. As more young pet owners embrace adventure with their pets, they're going to be on the lookout for harnesses, hiking gear, and protective accessories such as the booties we mentioned earlier. This is also the time of year for summer vacations and plenty of travel. As kids are out of school, families take advantage of the time and go on adventures together - often bringing the dog with them. Travel accessories such as travel bowls, tote bags, and car gates are a good idea to have on hand. For those who opt to stay at home, summer barbecues are a great way to spend time with friends, family, and the dog. But for some, worrying about what the dog is up to, who he's jumping on, and what he's getting into can be a lot to stress about. That's where products like the Pet Gazebo come in handy, as they allow the pet to hang out outside with friends and family while also staying out of the way and in the shade. Merchandising Tip: For store locations with plenty of adventurous customers, set up an "adventure zone" and display anything your customer may need for their next big journey. Bonus: Set it up by type of adventure (i.e. hiking, road trip, camping, barbecue, etc.). No matter which products you stock in your shop, there's a way to provide the education and inspiration to help your customers understand the importance of keeping their pets safe and hydrated, especially in the heat. Get creative with your merchandising and encourage your employees to share advice - even if it's one tip of the day - to customers as they come into your store. Who knows? You could be helping a pet or two because of it. Ashley Hoffman is a freelance content marketer and writer for small businesses. Growing up in the pet industry, she has keen insight on market trends and a passion for helping small businesses grow. Her portfolio includes various topics from pet food trends to using technology and marketing strategies to boost pet business sales. When she's not writing articles or working her day job, she's playing with her cat (Chewie), reading a book, or hiking one of Washington's many trails.